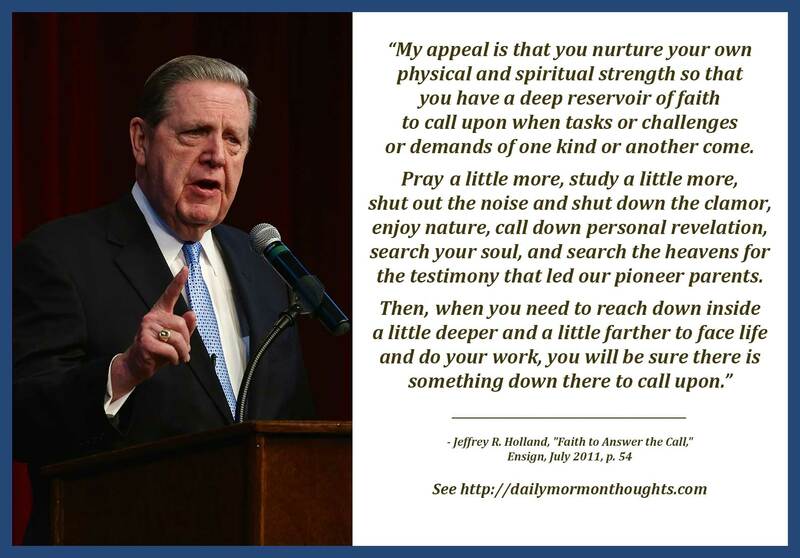 Elder Jeffrey R. Holland (b. 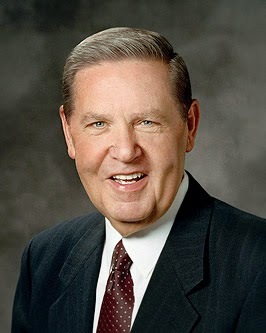 1940) served as Church Commissioner of Education from 1976-1980, as the president of BYU from 1980-1989, as a Seventy from 1989-1994, and as a member of the Quorum of Twelve Apostles since 1994. "And so I issue a call for the conviction we all must have burning in our hearts that this is the work of God and that it requires the best we can give to the effort. My appeal is that you nurture your own physical and spiritual strength so that you have a deep reservoir of faith to call upon when tasks or challenges or demands of one kind or another come. Pray a little more, study a little more, shut out the noise and shut down the clamor, enjoy nature, call down personal revelation, search your soul, and search the heavens for the testimony that led our pioneer parents. Then, when you need to reach down inside a little deeper and a little farther to face life and do your work, you will be sure there is something down there to call upon. "We must have faith in this work—faith in what all believers are called to do, faith in the Lord Jesus Christ and in our Father in Heaven. We need to conform our will to Theirs and then make that will rock-ribbed and pioneer strong indeed. If we do that, I know we will be safe and secure in the inexorable onward movement of the Church and kingdom of God on earth." In this beautiful pioneer-themed sermon, Elder Holland shared some of my favorite stories about the challenges faced by early pioneers—not necessarily in crossing the plains, but also in the settlement of the west. These include the stories of the Hole-In-The-Rock pioneers and the faith of young Elizabethe Claridge McCune. They are marvelous examples of the love, loyalty, and firm dedication these early Saints had for the faith they had embraced. The list of suggestions in this excerpt is wonderful: pray more, study more, focus more, enjoy nature, seek revelation, cleanse your soul. With that reservoir established, and our faith is "rock-ribbed and pioneer strong," we are then prepared to bless those around us, starting with our own families. We can truly carry on the faithful mission started by those previous generations and continue to bless the lives of those near to us, and through them, the whole world.